Whether you are a local or a visitor, you’re going to want to get out there and have some fun, but gearing up can add up in a hurry. Gear Fix is your one stop shop for quality used sports equipment and accessories. Yes, the gear is used, but this is not a thrift shop. The Gear Fix team likes to get out there as much as you do so they are happy to share their knowledge and answer questions about everything they carry…and they carry a lot. Skis, snowshoes, sleds, snowboards, boots, binding, and poles fill the shop when the snow is flying so you can outfit the whole family and go enjoy the powder. 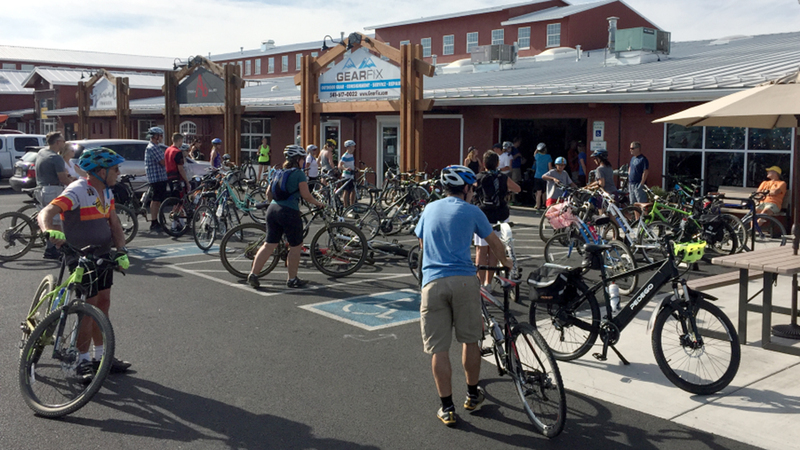 When the weather warms up, Gear Fix is bike central, stocking road bikes, mountain bikes, commuters, fat tires, even training bikes for the littlest riders. You’ll also find bike trailers, bike shoes, hydration packs, repair kits, tires, rims, and everything else you need to get you on the road or ripping down the trail. Gear Fix also has a huge selection of seasonal clothing in great condition and in all sizes, from babies on up, and their full -service ski and bike shop will ensure every piece of gear stays in great shape. And, if you have gear that needs repair (here we go with the “fix” part of the name) Gear Fix can handle it; from broken sleeping bag zippers to resoling climbing shoes to tuning up that old camp stove.